I know, I know. I'm a few days late - better late than never, right? Hopefully they'll post some better deals for the holiday coming up! Woah crazy weekend. I spent the majority of my day catching up on sleep because I had a child who decided that sleep wasn't necessary. Let's remember that Mama is pregnant and baby (and mom too really) need sleep, okay? Thanks. P.S. Tuesday is the big ultrasound appointment. I'm trying not to think about it because I'm seriously just too excited and nervous about it. I actually made it this week to CVS -- whoo hoo! And did some serious stock up on diapers this week. --Colgate Total Rinse or toothpaste or 360 toothbrush - $2.99 and earn $1 ECB. Use $1 off rinse or brush (SS 6/30) or $0.50/toothpaste (SS 6/30). Final Price: as low as $0.99 after ECB. --Speed Stick or Lady Speed Stick - $2.99 and get $1.50 ECB. Use $1 off (SS 6/16). Final Price: $0.49 after ECB. --ReNu contact solution - $7.99 and get $5 ECB. Use $2 off (renu.com). Final Price: $0.99 after ECB. --Schick Hydro Silk, Power, Hydro 3 or 5 - $9.99 and get $4 ECB. Use $2/Hyrdo Power, 3 or 5 (SS 6/9). Final Price: $3.99 after ECB. --Pepsi 2 liters - $0.99. Use $0.25/Mt Dew Kickstart (CVS coupon - machine from store). Final Price $0.74. Not a great week, but you could grab some razors and deodorant at least! 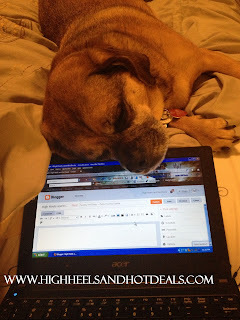 Apparently the life of seven year old Puggle is pretty rough. I mean let's be honest - going for a 2 mile run, sleeping in the sun and chasing birds and dogs in the backyard is hard work. Okay on to the REAL star of this post -- Mr. Potty Pants himself! We are currently two weeks and two days into potty training and honestly I think we are doing AMAZING!! He's had just one, yes one, accident in the past two weeks. I'm so proud of my little guy. We have been swimming, to the zoo, on several play dates and to the park and he'll still let me know when he has to potty. Now, he still wears a diaper to nap and bed and he isn't waking up dry, but I think that's something we'll conquer in the next few weeks. He is still a little hesitant to poop in the toilet so for the past week we've put out a "Caca Train" that he would get as soon as he went poopy in the toilet. (Yes, we refer to poop as caca, don't judge. But blame my mother for starting that one.) So tonight was a HUGE night. Cohen went poopy in the potty!!! We totally got all excited and danced and he was absolutely thrilled the he finally got to open his train. I'm hoping that it wasn't a coincidence and that it will happen again...like tomorrow. So far we are doing well and I'm really happy with his progress. We are going on a road trip to our hometown this weekend so it will be a big test of our training. Any tips on night time training I'd love it! This week Pampers wipes are Buy 4 and get $4 off instantly. If you use the following coupons and your store doubles you will get these puppies FREE! Time to stock up mamas!! The last few days here in Indianapolis have been hot and heavenly! Cohen constantly asks for me to take him to the "big pool" which is our neighborhood pool and I have to take him. Plus, I'm not kidding when I say that there are like five people there tops. Such a better crowd compared to our old subdivision! --Gillette Venus or Fusion ProGlide razors - Buy 1 get $5 ECB. Use $5/Venus or $5/ProGlide (RP 6/16). 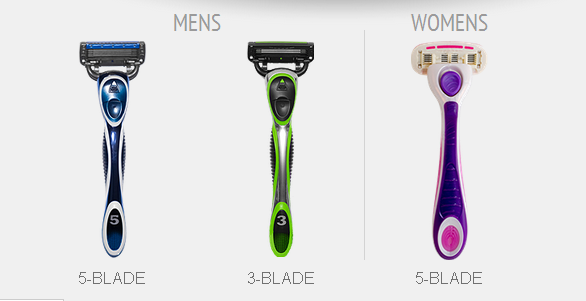 Final Price: varies BUT depending on what your store's prices are for these razors they will be a MONEY MAKER! --Crest ProHealth or 3-D rinse - $4.99 and get $4 ECB. 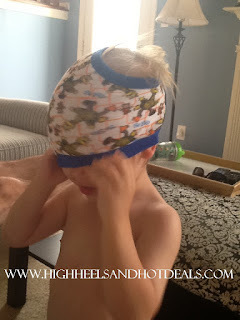 Use $1.10 printable or $0.50 off (June PG). Final Price: as low as FREE plus a Money Maker!! --Crest 3D White, ProHealth or Scope toothpaste or ProHealth rinse - $2.99 and get $2 ECB. Use $0.50/toothpaste or rinse (Jung PG). Final Price: $0.49 after ECB. --Colgate Total rinse or toothpaste or 360 toothbrush - $4.49 and get $4 ECB when you buy 2. Use $2/mouthwash (SS 6/2) or $1/ mouthwash printable . Final Price: as low as $0.49 each when you buy 2 after ECB. --Coppertone Sun Care - $9.99 and get $8 ECB when you buy 2. use $5/2 (SS 6/23). Final Price: $3.49 each when you buy 2 after ECB. 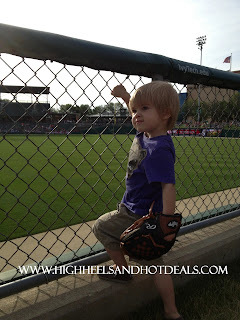 --Huggies, Pull Ups or Good Night jumbo packs - $9.49. 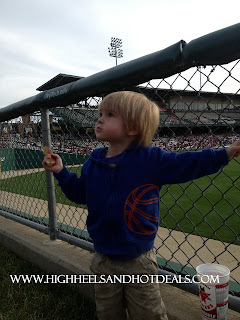 Use $3/Huggies (walmart.com or SS 6/23) or $2/GoodNites (SS 6/23). Final Price: as low as $6.49 -- I also got a $1.50/Huggies jumbo pack CVS coupon in the mail which will bring this down to $5.99! Good razors are hard to find at a reasonable price. When I do catch them on a hot sale, I try to stock up but unfortunately that isn't enough for my family. I have this issued with my husband especially who is extremely particular about his razors. I'll be sympathetic with him because he does have sensitive skin on his face so he prefers the razors with the 5 blades. However, I cringe every time I have to buy his razor cartridges for $17 a pop - and most of the time that's with a coupon! So I started looking into other options because I knew there was a better choice. 800razors.com is a website that offers razors and cartridges delivered right to your door for a price that you can't beat at your local store. Currently they offer a 3-blade and 5-blade razor for men and a 5-blade razor for women. These razors are comparable to the name brands you find at the store but at literally half the cost! You just choose the razor of your choice and order the number of cartridges that you are looking to purchase. Prices start at $9.99 for 4 cartridges and there is FREE shipping! You will also get a free handle for your first purchase but if you are interested in ordering more, handles cost just $3.99. 800razors.com also offers you the option of an automatic shipment every two, three or four months so you make sure to never run out of razors. Now, I'm sure you're wondering about quality, right? Well of course I had my toughest critic test out the razors for me...my husband. For the past month he's been using the 5 blade men's razor which is comparable to the Fusion. His thoughts? He's highly impressed! He said the shave is clean and gets his hard spots. There was no razor burn or cuts after his shaves which were big factors in his testing. My husband's only complaint was that it didn't vibrate like his his Fusion does, however let's remember he is a diva. Overall though he was greatly pleased with the results. 800razors.com offers convenient service and affordable razors shipped right to your front door. They promise a burn free experience not only on your skin but to your wallet too! Don't get burned by razor prices as the store - it's time that you save yourself money and check out 800razors.com! --To purchase your razors, check out 800razors.com. You can also find them on Facebook, Twitter and Pinterest. This product review was made possible by 800razors.com. I was not compensated for this review other than a product sample. All opinions are 100% mine. How is tomorrow already Friday? And why is it almost July? Seriously, summer is going by WAY TOO FAST! Here are a few of this week's best deals at Meijer -- and don't forget to clip your 5% off your grocery purchase mPerk that's good Friday and Saturday! --Coke 2 liters - 4/$5. Use $1/4 mPerks. Final Price: $1 each when you buy 4. Cohen is really into dragons and monsters lately. Currently, one of his favorite shows is Mike the Knight on Nick Jr. Let's be honest there are only so many episodes you can put on the DVR. 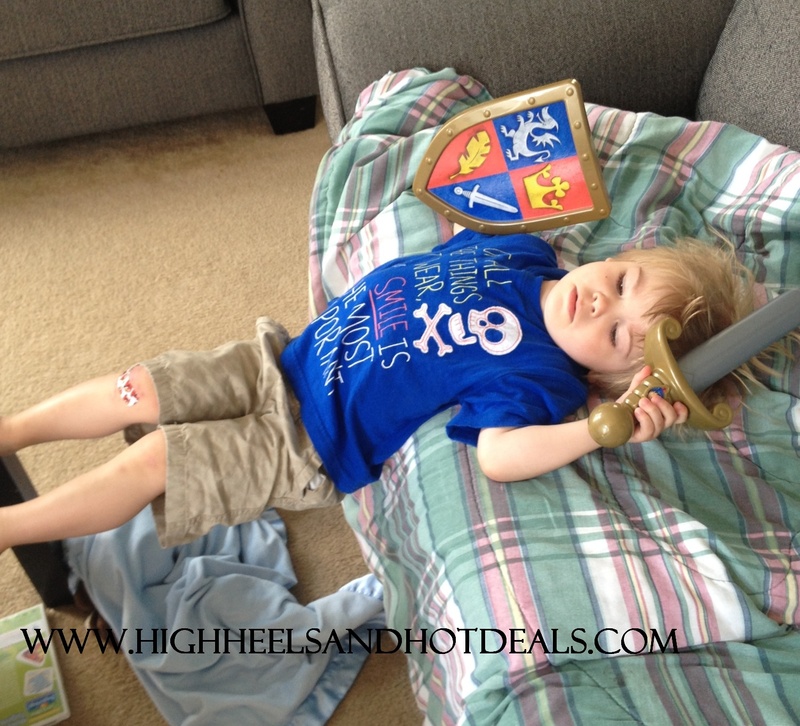 That's why when I heard about Mike the Knight coming to DVD I was just as excited as Cohen! Recently NCircle Entertainment, along with HIT Entertainment announced that this month a new DVD, "Mike the Knight: Knight in Training" had been released. This new DVD features five adventures which find Mike on missions to serve and protect the Kingdom of Glendragon. From finding the perfect birthday surprise for his sister Evie, or helping others find their way back home, every day is an adventure with Mike and his friends! The all-new Glendragon Matching Game, as well as Meet Mike’s Friends! Music Videos and a karaoke version of the theme song are also included. The DVD will sell for $12.99 and is approximately 56 minutes in length. Cohen is obsessed! We have to watch at least one episode every night and he is totally into Mike and his adventures with his friends. 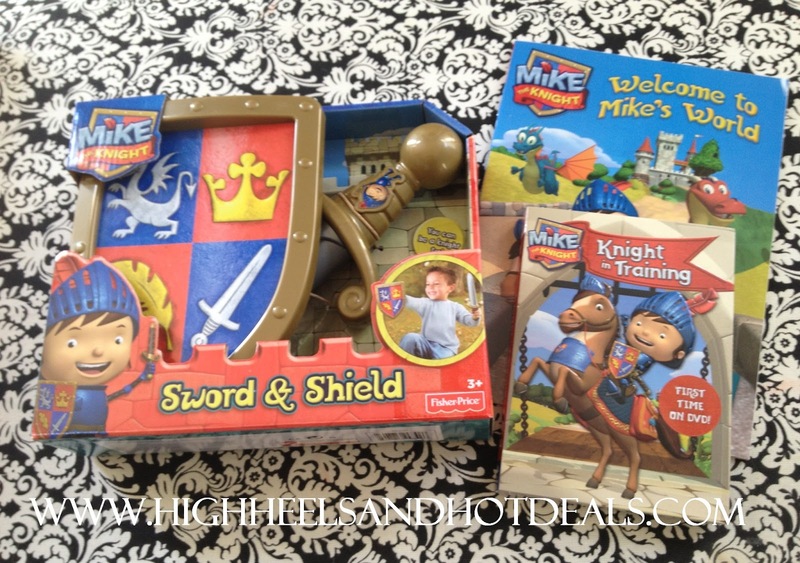 As part of Mike's new DVD release, Fisher-Price also launched a variety of Mike the Knight toys. I have never seen my child love something (except for his monkey blanket) as much as he loves his Mike the Knight Sword and Shield set (retails for $9.99). His eyes lit up when he saw the package and for the past week he has made sure that his "fork and shield" as he calls them go with him to take a nap or when going to bed for the night. This was after nap (hence the bed head) as he was watching his new Mike the Knight DVD. Look at his extreme focus on this new movie! Simon & Schuster Children’s Publishing also released a line of new books, including the fun activity book Welcome to Mike's World (retails for $4.99). Cohen and I have fun reading it together. 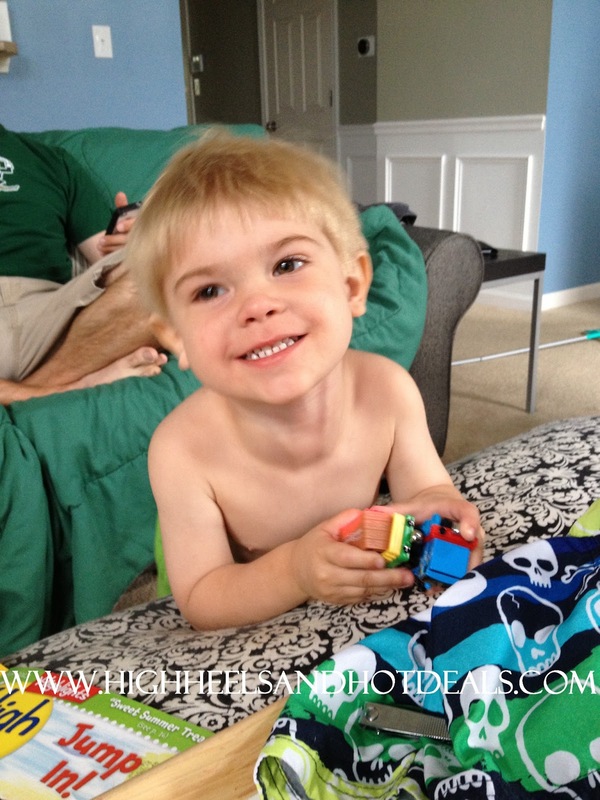 He loves to find Mike and his dragon friends Squirt and Sparkle. As you can see he loves to look at the pictures but he also loves coloring Mike too! As a parent, I love how Mike the Knight is fun for all ages and encourages problem solving skills as well as teaches young children the importance of doing what is right. Mike and his sister Evie's adventures are the perfect balance of fun and life skills, especially when the magic includes his friends Squirt, Sparkle and Mikes horse Galahad. Mike the Knight: Knight in Training is the perfect addition to your summer DVD list. So grab the popcorn, jump on the couch and enjoy a family night filled with Mike! 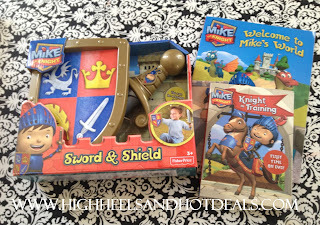 --Check your local retailers Mike the Knight: Knight in Training DVD, Mike the Knight Sword and Shield set and "Welcome to Mike's World" activity book. --One (1) lucky winner will win the following royal package: Mike the Knight: Knight in Training DVD, Mike the Knight Sword & Shield and “Welcome to Mike's World” book from Simon & Schuster Children’s Publishing. This giveaway is run via Rafflecopter. The more entries completed, the better your chances of winning! Open to US residents only. This product review was made possible by NCircle Entertainment. I was not compensated for this review other than a product sample. All opinions are 100% mine. Now that summer is here I feel more trips to Target in store! I still need to figure out my coupon printer -- that beast is driving me bananas! --Almay Intense i-Color eye shadow, mascara or liner - $4.99. Use $4 off (SS 6/2) and $1 Target coupon (target.com). Final Price: FREE -- I seriously LOVE the eye shadow!! --7-Up 10, A&W 10, Sunkist 10 or Canada Dry 10 2 liters - 3/$5. Use $0.75 off (SS 6/9). Final Price: $0.58. --Archer Farms flatbread pizzas - $3.50 each and buy 3 and get 1 Free. Use $1.25/2 Target coupon (target.com - grocery). Final Price: $2.31 each when you buy 4 -- these are sooo yummy! There's a few good deals this week, especially on Kraft products and a bunch of new printables to go along with the sale just popped up! --Kraft singles - $2.49. Use $0.50/2 printable which doubles to $1. Final Price: $1.99 each when you buy 2. --Kraft Salad Dressing - $1.99. Use $1/2 printable. Final Price: $1.49 each when you buy 2. --Kraft Cream Cheese - $1.99. Use $0.50/2 printable which doubles to $1. Final Price: $1.49 each when you buy 2. --Yoplait yogurt - 10/$5. Use $0.40/6 printable which doubles to $0.80. Final Price: $0.37 each when you buy 6. I have been working with Cohen for a few months in preparation for this time. We would wear our big boy undies in the afternoons and evenings when I'd pick him up from the sitter and practice using the potty before bath or just randomly when he'd tell me he'd have to go. What I have found with Cohen, however, is that if I put a diaper or Pull-Up on him he doesn't even attempt to go to the bathroom. So my goal was to spend the first week of break tackling the potty training since I knew I'd be able to be home with him the entire time. Sunday - Day 1: Surprisingly we had very few accidents. Our biggest one was when he got mad and wanted to have a popsicle for lunch. So he decided it would be appropriate to just pee on the floor by the window Let's just say there were no popsicles the rest of the day for that tantrum. However we did attend a graduation Open House and he actually told me he had to use the potty while we were there thus scoring him an extra M&M (which were ironically used at centerpieces on the tables). Monday - Day 2: Still, not too many accidents but luckily I make him sit on the couch with a blanket or I would've had a huge mess to clean up. Cohen really seems to be responding to the M&M technique as well as the fact that he's earning a new game on the iPad for a day when he can make it accident free. Overall I'm pretty proud of my little man. 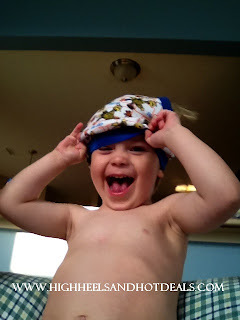 We do use diapers or Pull-Ups at bed or nap and refer to them as our "special night night undies." I'll tackle that one later on. But what kills me is he always wakes up with a poop in the morning or after nap so I haven't had a chance to have him try to use the potty for the poop. I asked him why he doesn't want to use the potty when he has to poop and he told me, "I'm too big." Honestly I think he's afraid but that's okay, one step at a time. This mama is three days into the training and I'm going to attempt a Target trip this afternoon. I now make sure I care a spare change of clothes with me whenever I leave the house just in case. Overall I'm really happy with his progress and just cross my fingers that we don't have any set backs. I'll update you all later on how things are panning out in the next few week! Hey, remember once upon a time when I used to do these posts? Now that the sickness has subsided and summer is here, I have time to enjoy my family and really get back into the swing of things. The previous three months I did a lot of NOT cooking. It was soup, bread or take out. My husband really wasn't a fan. But now I'm 100% better than before so I'm trying to cook more often. Saturday was Cohen's first "soccer practice" -- remember he's 2 so it was a group of toddlers running around like crazy. So we got home just in time for lunch and I needed to cook something up quick. Cohen and my husband both requested fish sticks and tater tots but I wanted to add a little more green to mine. I decided to take my sticks and make fish tacos with them! Super easy and actually pretty yummy! My ranch came out a little fast as you can see.. The process is super easy and while the sticks cook you can prep the goodies for the tacos. 1. Cook the fish sticks according to package. 2. 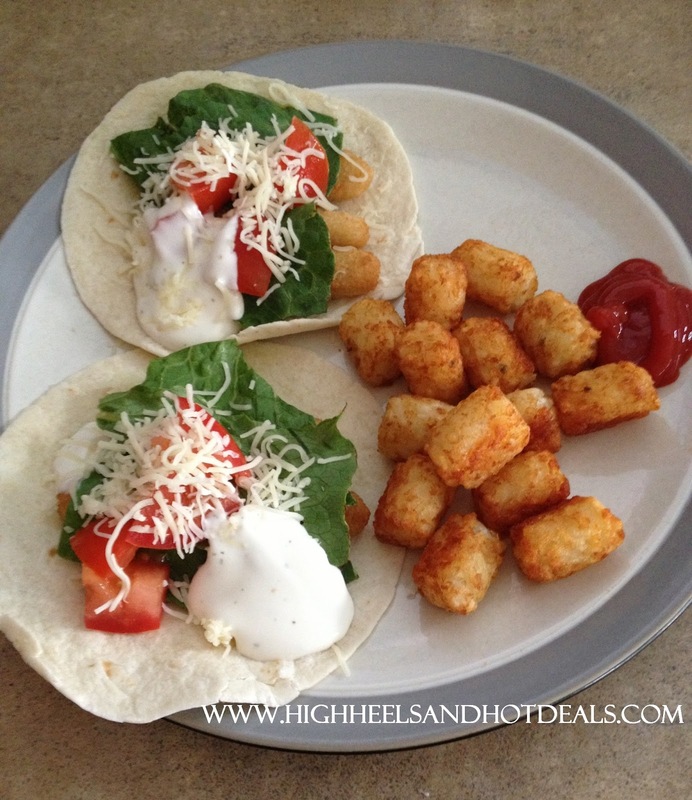 Once fish sticks are cooked and crispy, place 3 in the middle of your tortilla. 3. Dress up your taco how you like it and enjoy! 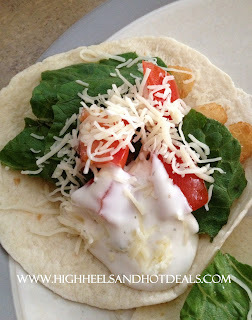 These fish tacos are perfect for lunch or dinner, especially on those nights when you're in a bind as to what you should cook for your family. If you have a picky eater like I do, another great thing is you can give that kiddo the sticks while the others enjoy the tacos without really wasting anything. Let's be honest, we all have nights where we just don't feel like cooking so a quick, easy and yummy recipe is what I'm talking about! I had the best intentions of getting this posted yesterday however it is the first weekend in a least a month here in the Indy area where we have had a nice weekend. Yesterday was in the mid seventies and we enjoyed an afternoon of playtime in our pool, water table and dinner on the patio. Seriously, how can you not like summer?!? --Select Colgate toothpaste, toothbrush or Colgate Total mouthwash - $2.99. Buy 2 and get $2 ECB. Use $2/mouthwash or $1/toothbrush or $1/toothpaste (SS 6/2). Final Price: as low as FREE after ECB. --Bayer Glucose system - $10 and get $10 ECB. Final Price: FREE after ECB. --Pantene, Herbal Essences or Aussie shampoo, conditioner or stylers - $2.99 and get $1 ECB when you buy 2. Use $3/2 Pantene or $2/2 Pantene printable or $1.50/2 Aussie or $0.50/Aussie or $1/2 Pantene or $1/2 Herbal Essences (all from June PG). Final Price: as low as $0.99 each when you buy 2 after ECB. --Gillette Fusion ProGlide razor - Buy 1 and get $4 ECB. 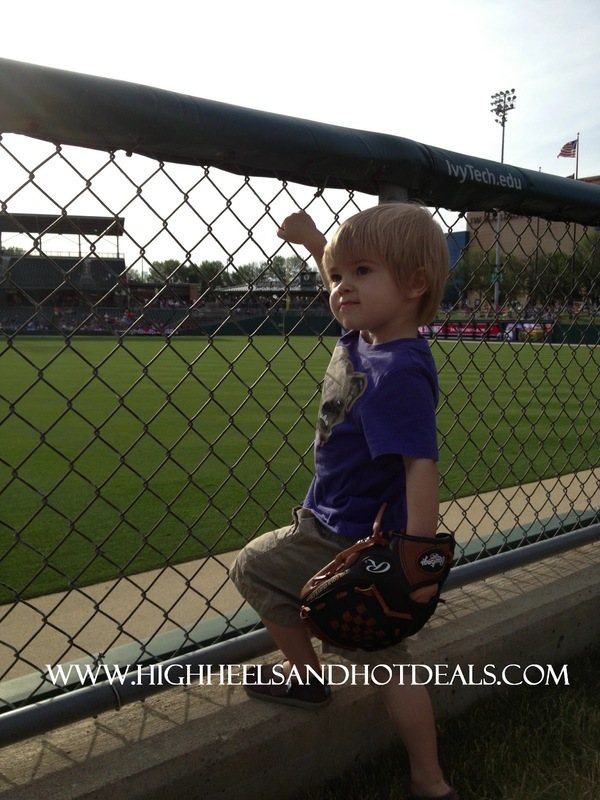 Use $3 off (late May PG). Final Price: varies but a GREAT deal for your man! --Trident gum - $1.00 and get $1 ECB when you buy 3. Use $1/3 (SS 5/19). Final Price: $0.33 each when you buy 3 after ECB. 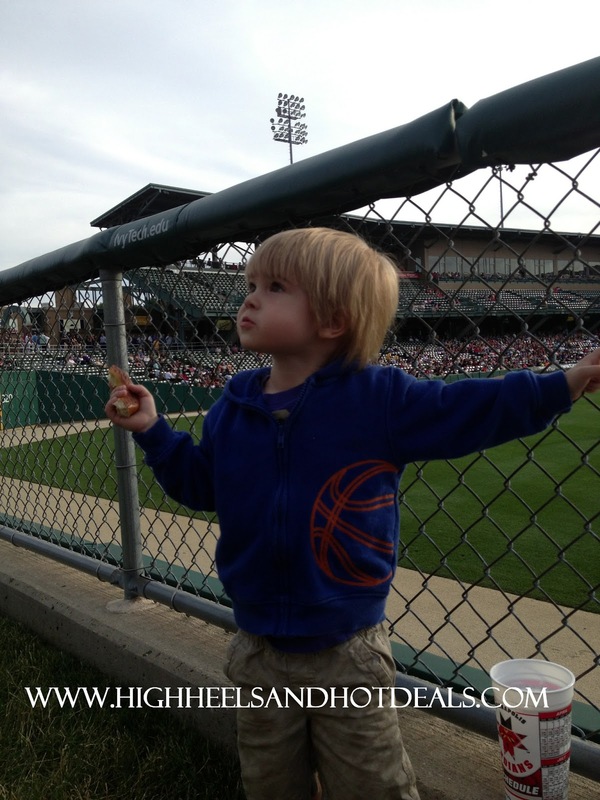 --Chex Mix - 2/$4 and get $2 ECB when you buy 2. Use two $0.50 off printable. Final Price: $0.50 each when you buy 2 after ECB. --Powerade, Honest Tea, Fuze, Smartwater or Vitaminwater - $1.00 and get $2 ECB when you buy 5. Final Price: $0.60 each when you buy 5 after ECB. --Pampers Jumbo packs - $9.99 and get $3 ECB. 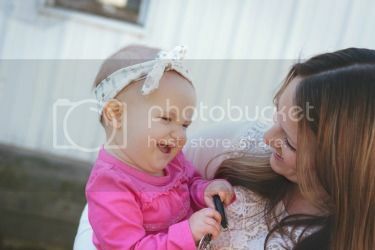 Use $1.50/Swaddlers Sensitive printable or $1.50/Baby Dry printable or $1.50/Cruisers printable or $2/Easy Ups printable or $1.50/Swaddlers printable or $1/2 Pampers (late May PG). Final Price: as low as $4.99 after ECB-- HOT DOG! --Tide - $5.94 and get $1 ECB. 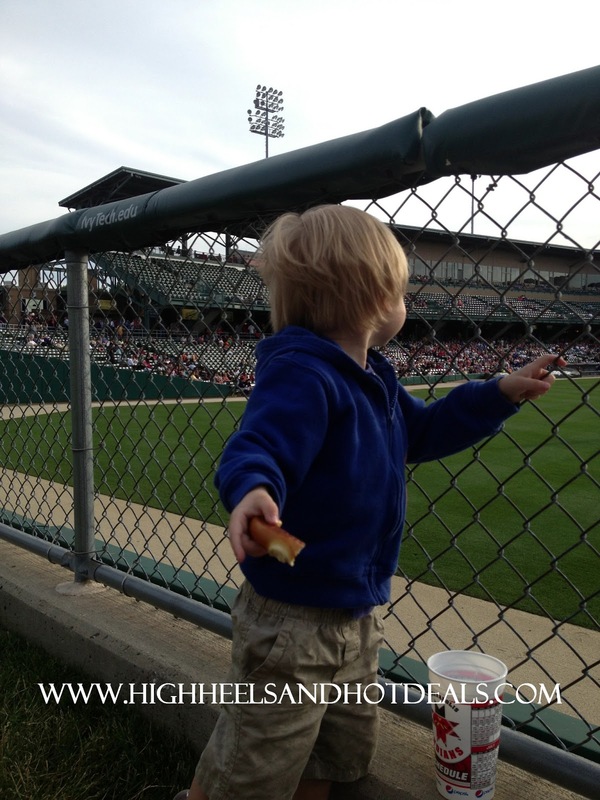 Use $0.40 off (printable or June PG). Final Price: $4.54 after ECB -- nice deal! Time to enjoy my Kindle and some sunshine. I know I'm a little late but don't worry, now that my workshop is done I am officially on summer break -- wahh hoooo! I was at the doctor yesterday for my montly baby check and the nurse goes, "Oh yeah, you're on break now. You teachers..." I laughed and said, "Oh Jen, you come do my job for one day and you'll understand why teachers are given this break - because otherwise we'd have a lot more crazy teachers!" --Merona Tees and Tanks (women's) - $5. Use $5 off $20 Target coupon (target.com - apparel). Final Price: $3.75 each when you buy 4. --Merona strap sandal flats - $12 -- I had to add this because I own 2 (soon to be 3) pairs of these sandals and they are great to go with almost anything! --Betty Crocker fruit snacks - 2/$4. Use $0.50/2 (printable) which doubles to $1. Final Price: $1.50 each when you buy 2. --Hamburger Helpers - 2/$3. Use $0.75/3 (SS 6/2). Final Price: $1.25 each when you buy 3. --All detergent - $2.99. Use $1 off (RP 5/5). Final Price: $1.99 -- I'm a huge fan of the All Free and Clear!! Don't forget that you can also get 4x the fuel points when you buy gift cards at Kroger this week! So, if you love Starbucks or Target, grab a gift card to use and then stock up on those fuel points -- because we all know that $4.25 a gallon is redic!